On our last evening in Germany, my mom made pork Cordon Bleu for all of us. It was a delicious meal and a perfect ending to a busy but fun trip and a great time visiting with my German relatives. 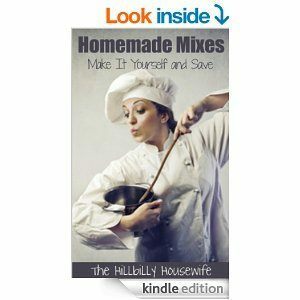 I thought I’d share her recipe with you today. There are a few minor tweaks I had to make because the smoked ham and cheese she uses are a little harder to get here (and when you can get them, they are quite pricey). If you’d like to make this exactly as my mom makes it, look for mild or young Gouda cheese and smoked ham called “Schinken Speck”. I find it tastes just as well with sliced ham and I often use mild cheddar cheese instead of the more expensive Gouda. We do not add any sauce to our cordon blue, but a slice of cut lemon is a nice touch for a special dinner. With a fresh salad and a side of potatoes, this is one of my favorite meals. Start by butterflying the pork chops. Use a sharp knife and slice down the length of the chop. Here is a simple[url href=”https://www.youtube.com/watch?v=5w0m9nwcN7w” target=”_blank”] video from the National Pork Board[/url]. Don’t cut all the way through the meat and pound it out just a bit. Place a slice of ham and a slice of cheese on the inside of the pork chop. Fold the chop together and secure the open side with a toothpick. Repeat with the other chops and set them aside. Crack the eggs into a shallow bowl and beat them with a fork. Pour the bread crumbs into a second bowl and season them with salt and pepper. Heat the oil and butter in a large frying pan over medium high heat. Dip each stuffed pork chop into the egg mixture and then into the bread crumb mixture, coating all sides. Gently place the meat into the frying pan. Cook them for for 5 minutes on each side or until the meat is cooked through and the cheese in the center is melted. Lower the heat as needed to keep the breadcrumb coating from burning as the chops cook. 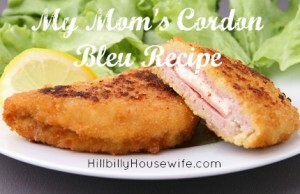 Remove the finished Cordon Bleu from the pan and set them on a cloth or paper towel to remove any excess grease before serving.